I’ll soon have a page dedicated to all the work I do to make it easier for future clients to see what I can do. Do you have any DIY projects? If so, please share! Despite the rainy cold weather were still having and the snow that’s slowly but surely melting. I’m ready for spring to finally arrive. It’ been a while since I’ve posted something I created. 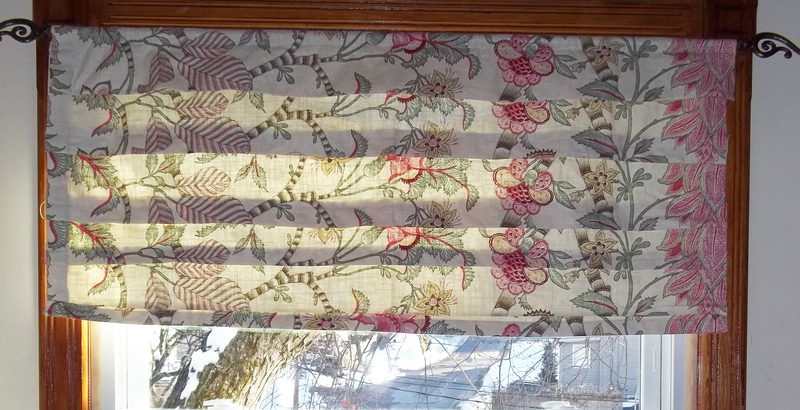 So my recent DIY project is a roman shade that’s easily washable (dry clean). Here’s how I created the look. I used the remaining scraps from a previous drapery project. I’m over this snow and ready to see some green! Tell me your thoughts about my new project. Any suggestions? From the white wood paneling to the white layers of bedding. If I was a guest at this home I don’t think I would move any further then the bed. The white on white is crisp and clean. The windows are hinged with interior screens to keep out the pesky insects. 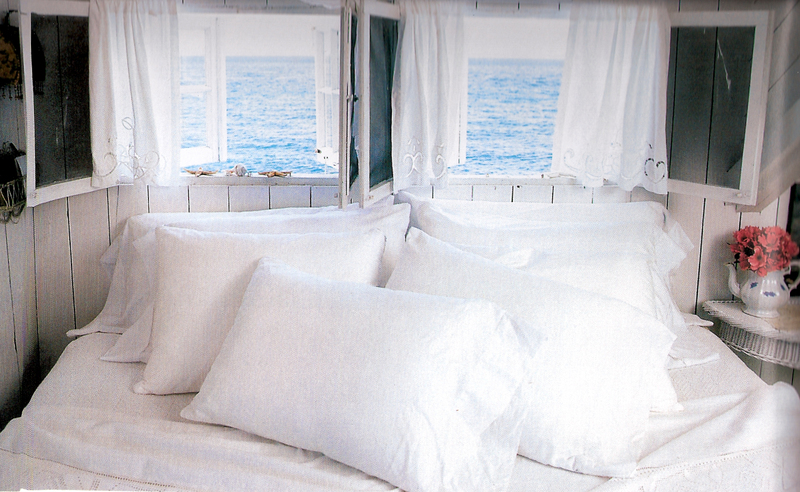 The morning sunrise would greet me every morning and the I’d welcome the ocean breeze. 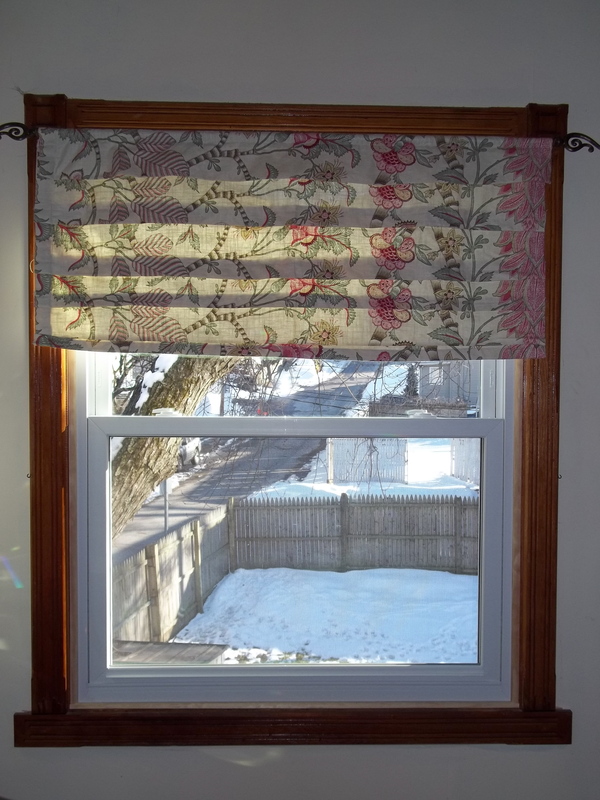 These curtains are inexpensive, washable and casual but you would normally find them above a kitchen sink. 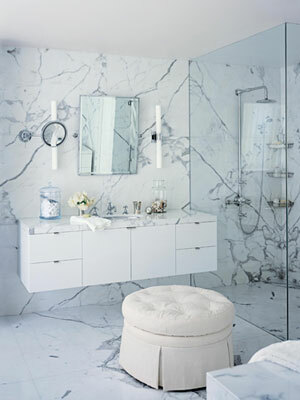 One of my bathrooms are currently a shade close to this if not the same. So I’m glad I’m not the only one who used this color. White keeps the room calm and relaxing. The mirror placed right under the picture frame balances out the small framed space so it doesn’t look too bare. The white cotton slipcover gives new life to this French reproductive sofa; that was found at a local flea market for a steal of a price of $30. Shuttered windows help play off the country theme. All what I need is a good book and a throw and I’m good to go!! 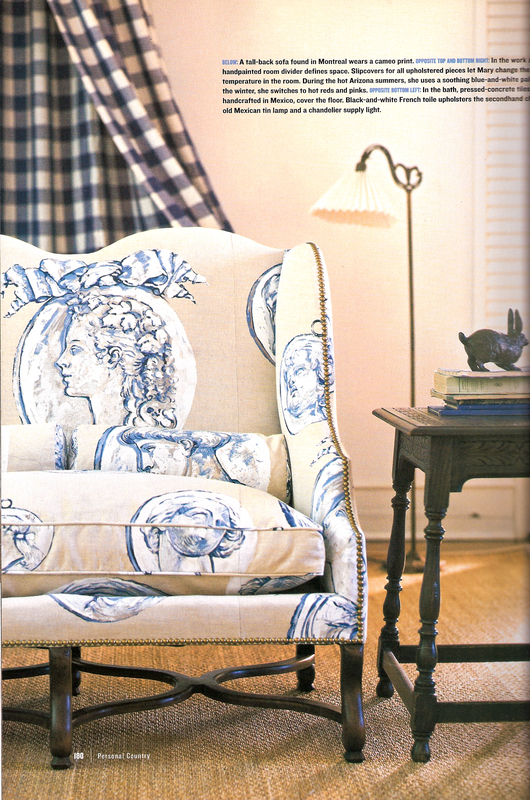 Bring in a little old charm of blue and white plaid for draperies. Something I’m pondering on doing myself…that will be a later post for sure! The weaved area rug adds texture and warmth to the floors. I love, love, love this tall back cameo print sofa. The nail heads define the lines of the sofa that adds timeless elegance. An old Mexican tin lamp shows you can mix different influences in one room. I also adore a wooden table with details. It reminds me of the wood working people take pride in doing. 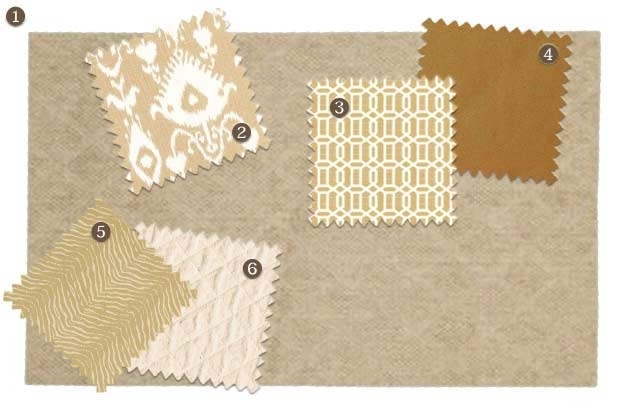 Do you have a room decorated with world influences? If so where did you travel? Last week one of my fellow bloggers Emily, House of Turquoise. Posted that Domino Magazine was no longer going to be in existence. Emily was able to grab some photos just before it was taken down. Coincidentally, I went to the library earlier that week to take out one of their books to get some new inspirations. I also took a look at the site because I couldn’t believe it. Low and behold the site that was once the home of Domino Magazine has now been forwarded to Architectural Digest. So in honor of Domino Magazine I too wanted to pay my respects to them and share some of their past pieces of decorating. 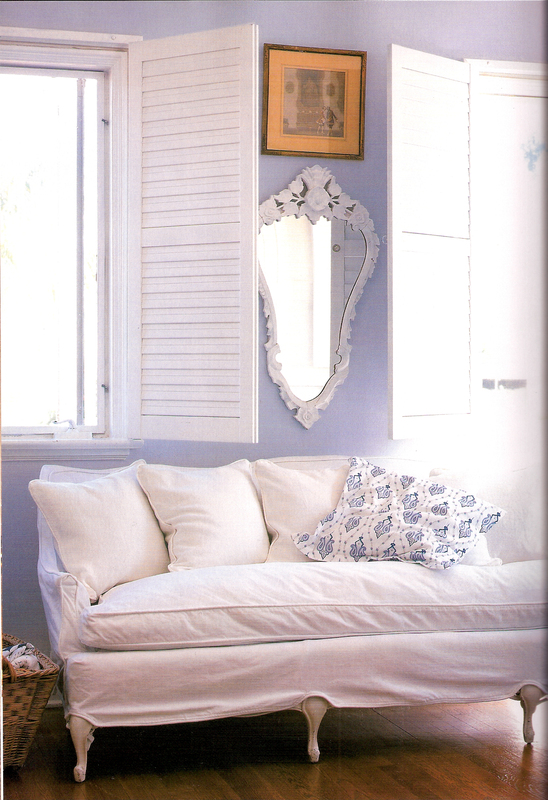 Here are a few of my favorites from, “Domino The Book of Decorating”. Note: pages will appear blurry, because the crease between both pages. 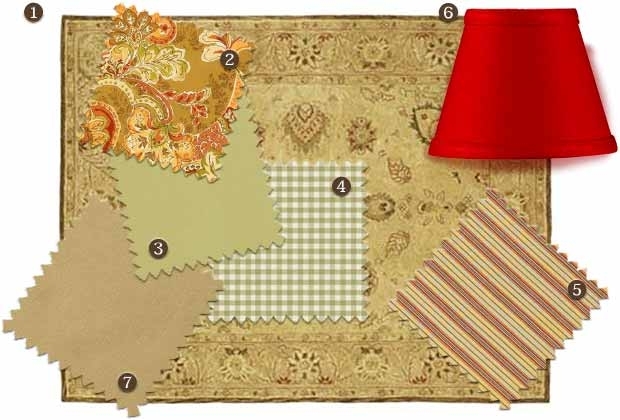 Yesterday I received this e-mail from Ballard and they show how you can mix & match colors and prints. Without making it look too busy and crazy! The key is to pull the (multi) colors from the patterns and spread it through out. Always remember 60-30-10. If you’d like to see more products from Ballard click here! Happy Friday all & looking forward to the warm weekend! Release your inner wildlife into your home. From the foyer to the bedroom. Don’t be afraid to add some pizzaz to your decor. Here’s some images below to give you some ideas of how animal prints can work with your room, and not look like it’s a piece of dead animal laying on the floor or on your sofa. The chocolate brown walls and antelope-print carpet only compliments the room with layers of brown. The high beam panels along the ceiling brakes up the chocolate. But most of all what I love about this room is the vintage Louis Vuitton luggage that not only had been owned by JFK, but bore the president’s monogram. The JFK suitcase serves as the family room’s coffee table, raised on a iron base. Again I love using old things with fresh new finds. Natural light from the huge window brings in a lot of bright light to fill this beautiful room. OMG!! This room is to die for…ok well maybe not literally but I love loft spaces. I’m still planning of the idea of owning my own loft one day. But for now it’s wishful thinking. The original brick archways lead to the outside which are now fitted with French doors. 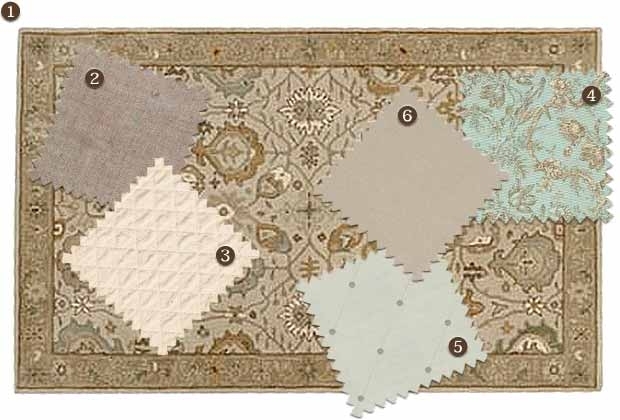 Floor to ceiling draperies match the furniture and area rug. Designed by the fame Johnathan Adler. He shares natural colors from the outdoors in for this magnificent sun room. The aquatic blue reminds me of the water or the sky, green from the grass and last but not least brown from the trees and the dirt! In this room it relates to it’s purpose and he shows it off the way it should be! This room is chic. Wouldn’t you agree?! Brr… It’s windy and cold today no where near compared to the spring like weather we had yesterday. It was warm and beautiful here in Connecticut and most of all it was Valentine’s Day! My morning was going oh so well until I got hit with some disappointing news. My company started laying off people and I was one of them-who got cut! But I got through it with a smile on my face and my head held high. I was always told once one door closes another door opens. And the way I see it, it’s an opportunity hiding in disguise. So I look forward to a much brighter future! So in that memory I was inspired by blue. When people think of blue they think of depression, sadness and sorrow. But for me I see beauty, and style. Cheers to the blues! Waking up to a view this beautiful is a dream come true! I already imagined myself sitting out on the balcony sipping a mimosa reading the local newspaper and planing my daily activities. 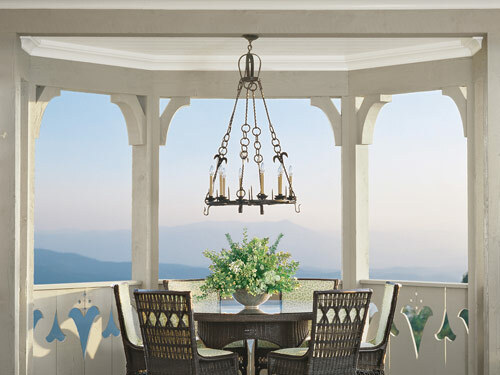 The view is overlooking the Blue Ridge Mountains. I love the vintage chandelier gives it charm and history. The fresh greenery from the vase makes the table pop! The white architecture details just flows around the table. It’s clean and simple! What I first noticed about this room were the floral picture frames that drew my eyes up to the ceiling. Now that’s how you play up a high ceiling!I love working with different shades from the same color palate. The pattern is used from the drapes and then repeated along the two side chairs. The other colors are pulled from the print to make the room work. Could you imagine this being your dining room? I would use this space for more than just making dinner with family and friends. How would you use this space? Please don’t wake me if I’m dreaming! 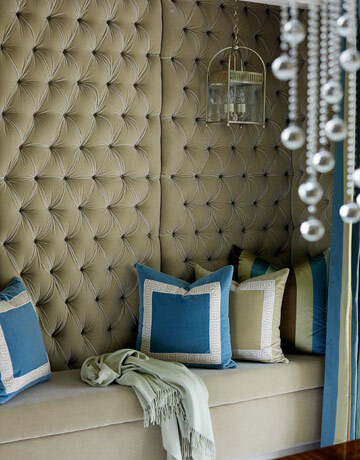 The wall paper along the walls are small in detail but adds a touch of elegance. The room itself reminds me of Hollywood glam! February is best known for the month of love [Valentine’s Day]. Also in this month we celebrate the Chinese New Year – known for their vibrant reds and other bright colors. And the Heart Association. Here are some rooms I found as an inspiration that carries out red whether it be accessories, furniture or wall colors. Happy Valentines Day & Enjoy! !